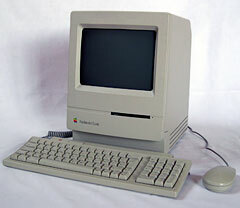 The Mac Classic uses an 8 MHz 68000 CPU. The installed hard drive is a 170 MB Quantum ELS170S formatted with LaCie Silverlining software. This was not the original hard drive, which was a slower 40 MB mechanism. Remember that benchmarks are arbitrary. They measure certain types of performance that may or may not reflect the way you work. The system was tested on 2000.11.22 using System 7.1 and System 7.5.5 with extensions off. Results for a Mac Classic should be 1.0, since it is the norm for Speedometer 3. These numbers compares performance under System 7.1 and 7.5.5 with two different hard drives, the internal ELS170S and an external Quantum Fireball ST2.1S. The disk cache was set to 128 KB for all tests. There is no significant difference between System 7.1 and 7.5.5. The faster, newer Quantum 2.1 GB drive outperforms the internal drive by about 5%. These numbers show virtually identical performance to the Mac SE, the computer the Classic replaced. Speedometer 4 and more recent benchmarks don’t run on 68000-based Macs. The newest addition to our benchmark suite is TimeDrive 1.3 (available here), which measures drive throughput. This can test a floppy, Zip, hard drive, or RAM Disk. TimeDrive is fairly primitive; the benefit of that is being able to run it on very old Macs. The Quantum ELS170S is a older SCSI hard drive with good performance for its era (circa 1995). We also tested our default external drive, a Quantum Fireball ST2.1S. Numbers are in KB/sec. Tests with other Macs show the ST2.1S runs faster than 4 MBps, so the 597 KBps write and 688 KBps read results seem to be limited by the Classic’s SCSI bandwidth.